Available on both Illumina and PacBio Platforms, CD Genomics offers the accurate and affordable mitochondrial DNA sequencing solution you’re looking for. Mitochondrial DNA (mtDNA) is a compact, double-stranded circular genome of 16,569 bp with a cytosine-rich light (L) chain and a guanine-rich heavy (H) chain. Mitochondria play a very important role in important cellular functions. In addition to producing over 90% of the energy required by a cell, mitochondria also generate reactive oxygen species (ROS) and participate in apoptosis and other important cellular functions. The mutant mtDNA and the wild type may co-exist as heteroplasmy, and cause human disease, including cancer, heart disease, diabetes, Alzheimer’s disease, Parkinson’s disease and hypertension. Because there is considerable clinical variability between mitochondrial disorders and many patients who exhibit phenotypes that overlap diseases, often diagnosis may only be confirmed by identification of a pathogenic mtDNA variant through molecular genetic testing of DNA extracted from a blood sample. Mitochondrial DNA sequencing is a useful tool for researchers studying human diseases, and be also used in population genetics and biodiversity assessments. 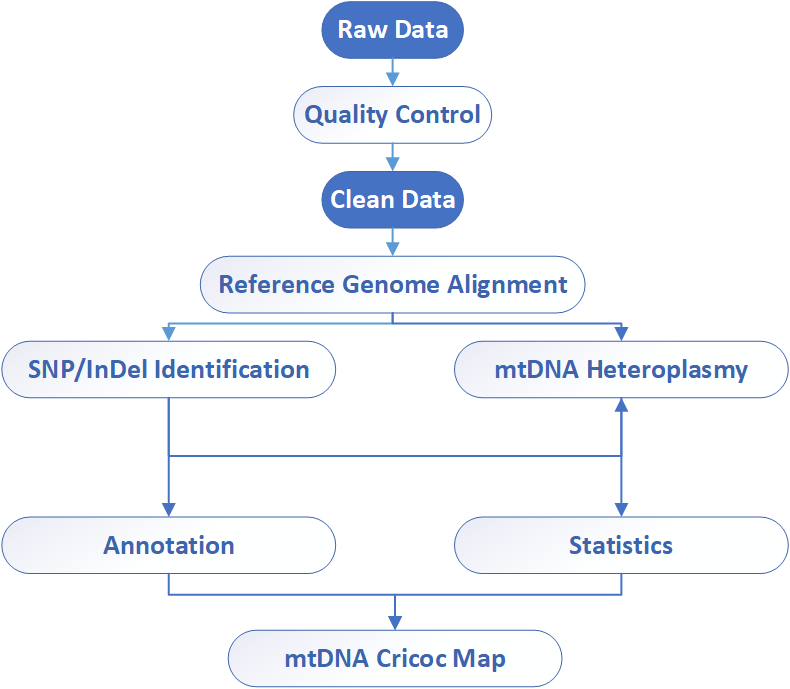 Mitochondrial DNA sequencing is available on both Illumina’s MiSeq, and PacBio Sequel System. Illumina next-generation sequencing (NGS) has the potential to transform mtDNA analysis. Take advantage of PacBio’s long reads, CD Genomics present amplification-free, full-length sequencing of linearized mtDNA. Full-length sequencing allows variant phasing along the entire mitochondrial genome, identification of heteroplasmic variants, and detection of epigenetic modifications that are lost in amplicon-based methods. CD Genomics offers cost-effective protocol of mitochondrial DNA sequencing, including how to prepare, sequence, and analyze the entire mitochondrial DNA (mtDNA) genome from clean, intact DNA samples. We can help you get a highly sensitive, specific, and accurate in determining mtDNA mutations and the degree of heteroplasmic level. Please contact us for more information and a detailed quote.